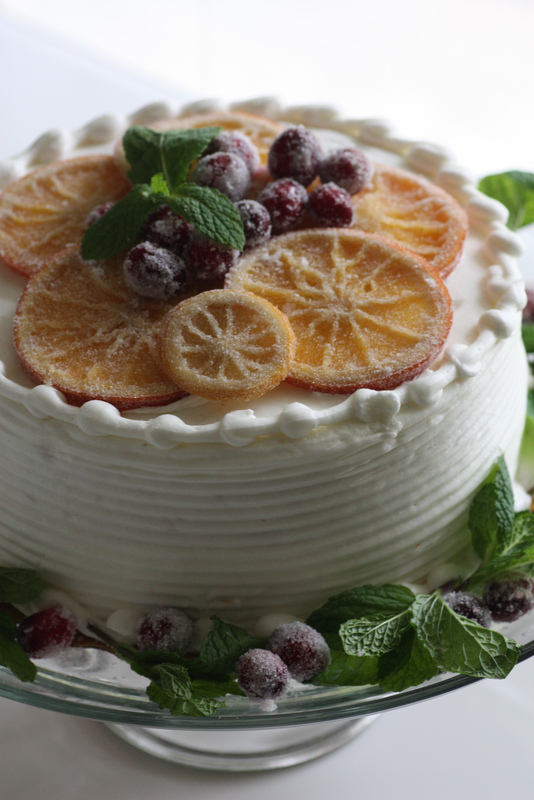 If you're serving cake this holiday, and need to save time, do what I did here. 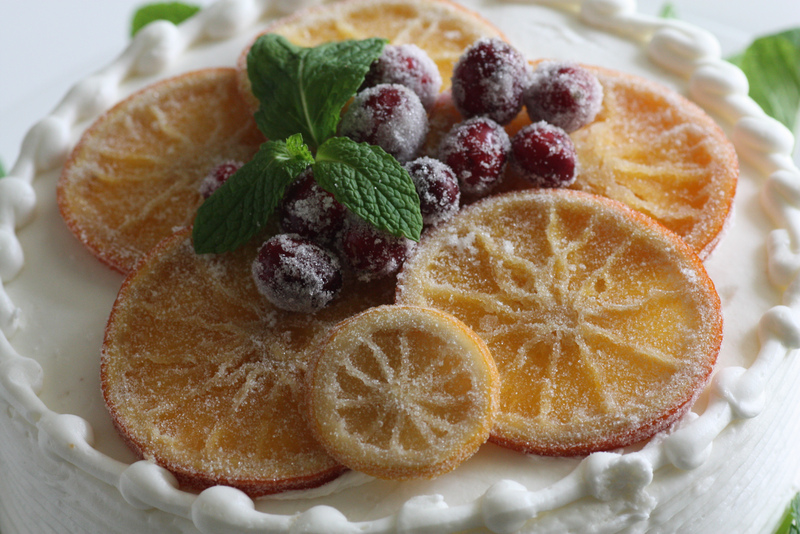 Buy a white cake at the grocery store, and add some homemade touches like candied orange slices and I promise your guests will be impressed. 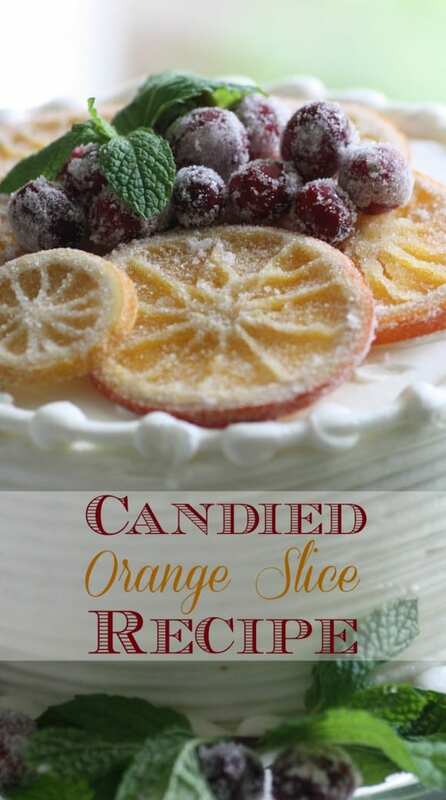 Making these candied orange slices was super easy. 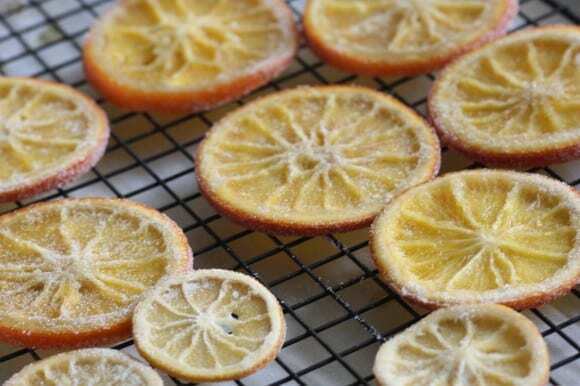 The only thing you need to be aware of is that your orange slices need time to dry, like two hours in a warm oven. Other than that, there's really nothing to it and the candied orange slices were delicious -- sweet, tangy, and chewy. They're definitely great for cake decorating, but you can serve them on their own as a candied treat, and your guests will eat them up! Thoroughly wash your oranges. 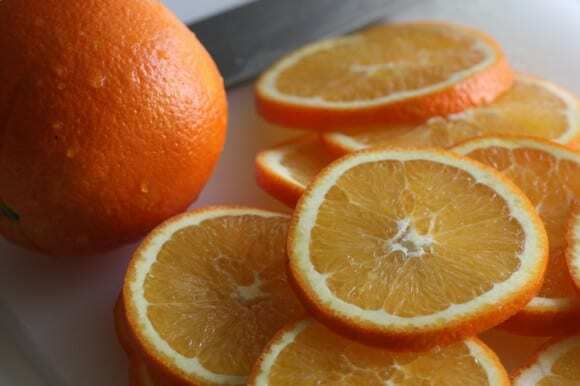 I like to use organic oranges when I plan to use the zest, or in this case, the whole peel.Cut off both ends of the orange then cut into 1/4 inch slices. To remove the bitterness from the peels, you'll want to blanch the slices. 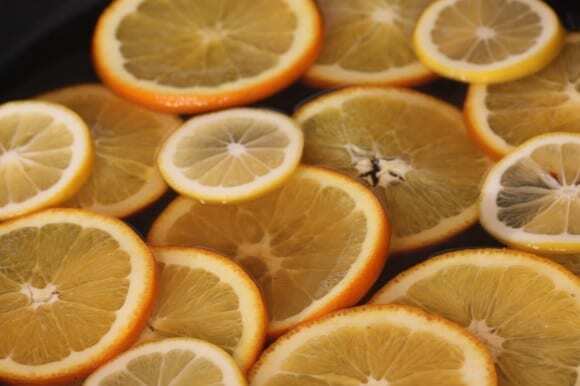 Put the slices in a pot of cold water. Bring the water to a simmer for about 5 minutes. Remove the slices from the pot and put in a bath of ice water to stop them from cooking. If you really don't like any bitter taste, blanch them for a second or even a third time. Add 3 cups of water and 1 1/2 cups of sugar to a large pan. I used a 14" skillet. Heat on high heat, stirring until the sugar is completely dissolved. Add the orange slices, and let it barely simmer for about 45 minutes, until the peels start to turn translucent. Let dry on a drying rack with parchment underneath until cool. Bake in a low temp oven at 170 degrees for two hours, to thoroughly dry them out, although they'll still be soft and chewy. 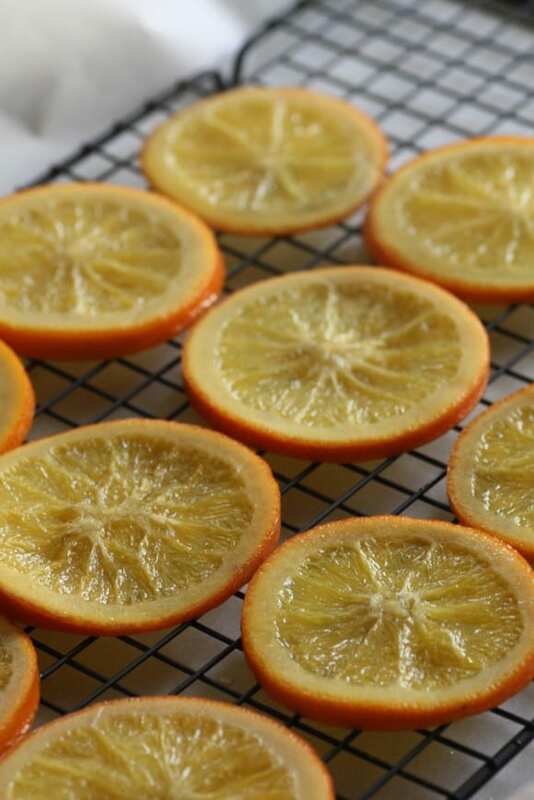 Add 1 cup of sugar to a bowl, and coat each slice of orange. Enjoy! BTW, the small slices in the picture are an extra lemon we threw in - the lemon tasted great, too, and definitely not too sour. After cake decorating, I served the candied slices with some mimosas. It was the perfect compliment. 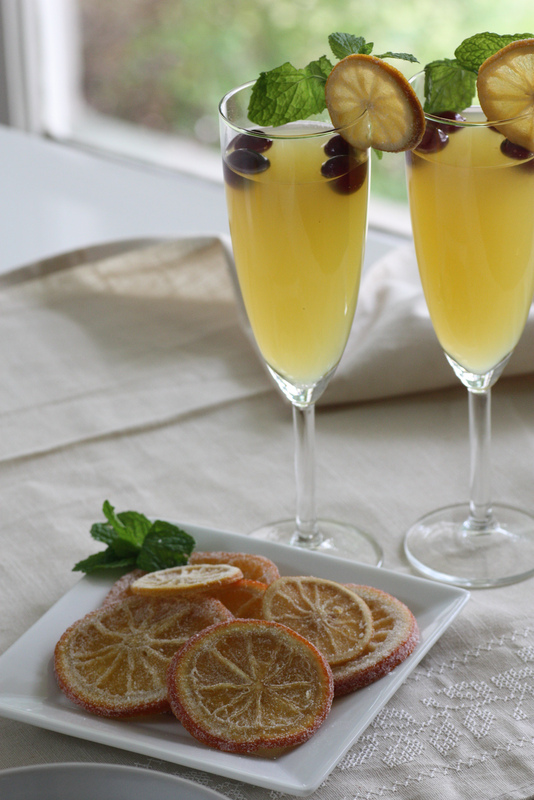 And check out my holiday garnish post on Babble to show how to use garnishes in two ways!